10 Inch Pneumatic Caster: CasterHQ's industrial pneumatic casters feature high quality air filled pneumatic wheels. These industrial casters are designed for low speed manually moved applications only. Air filled pneumatic wheels provide a cushioned ride, shock absorption and quiet operation. Pneumatic casters are ideally suited for moving fragile or delicate cargo where caster overall height is not critical. 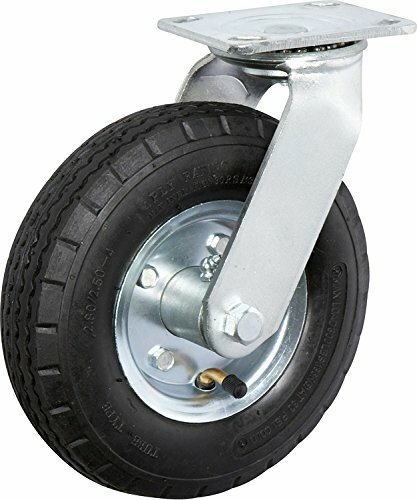 Casters with pneumatic wheels are usually the best choice for use outdoors over rough surfaces ( i.e. gravel ) , grass, or anywhere there are obstacles that need to be easily rolled over. The wide footprint on 8" or larger pneumatic wheels provides stability on gravel and does not sink into lawns. Pneumatic casters and pneumatic wheels are also popular for indoor use in places such as hospitals, scientific and electronic laboratories, hotels, department stores and TV or movie studios. Pneumatic wheels with black tires does not mark the floor as long as the wheel is allowed to roll freely. Changing directions without allowing a swivel caster to turn gradually around, or dragging a black rubber wheel sideways, can mark some floors. Wheel Size: 10" x 3 1/2"